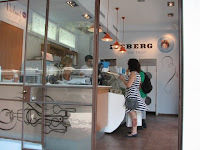 Iceberg is one of the best ice creams in Tel Aviv and considered by many Tel Avivians as their favourite one. Iceberg has many kinds of flavors to choose from. We can try to help you out by recommending on the banana pecan, classic vanilla, orange sorbet and the Belgian chocolate (well you can never miss with the last one). But who buys ice cream without trying it out first?